Online store «Russkye Valenki» offers souvenirs from Russia that can be worn in winter. 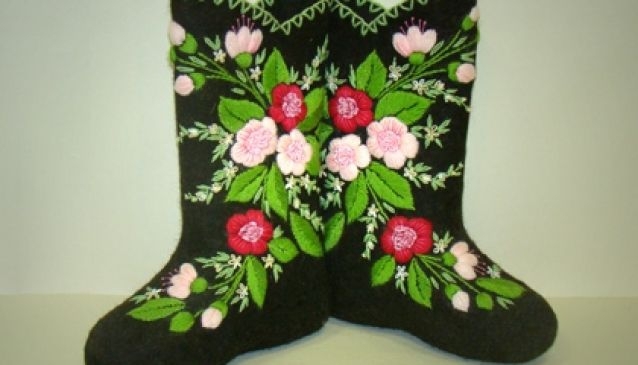 Valenki are the traditional Russian boots made from warm fleece. Since the invention of valenki, the range and quality of these boots has grown and improved so that now you can wear them in any weather and for any purpose, such as for walking on the street, hiking in the winter forest, working outdoors, or at home. The store presents a wide variety of models with fur, leather, beads, hand-made embroidery and Swarovski crystals. You can also buy related products: slippers, mittens, hats for bath and sauna, overshoes, socks, sweaters and jackets, pullovers, jackets, hats, mittens and scarves made of Icelandic wool.